You may have noticed the trend over the past several years where more and more couples are choosing to see each other before they walk down aisle and I have to admit that I love it! There are so many amazing benefits, both logistically and personally, to doing a first look at your wedding. This post is going to lay everything out and help answer any and all first look questions you might have! Before I dive too far into this I do need to say that this is a personal decision and ultimately YOU need to be the one making it. I’m sure your mom, grandmother, best friend, and photographer will all have their own thoughts on the matter, but at the end of the day you have to decide what is best for you and your fiancé. If you’re adamant that a first look is not right for you then your photographer should 100 percent respect that decision. However, if you’re at all on the fence about doing a first look and would like a little insight into why so many brides and grooms are choosing to buck tradition and see each other ahead of time than you’re in the right place! First things first: What is a first look? 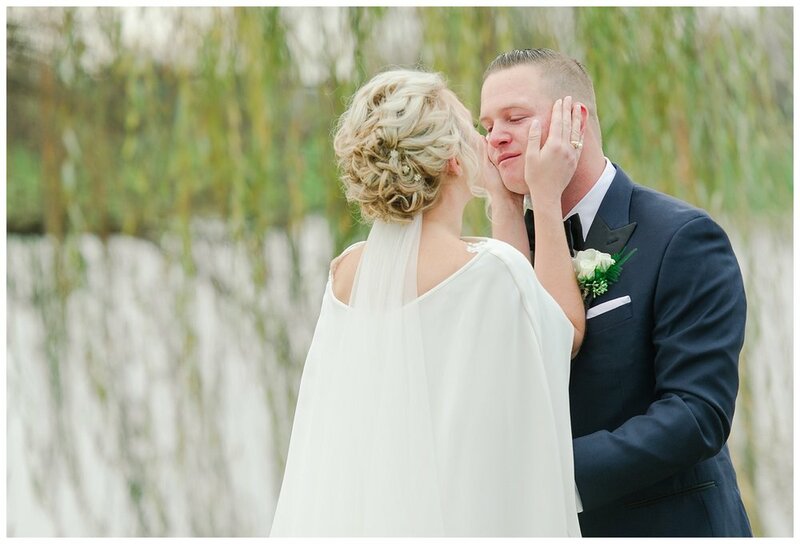 A first look is a special time for a bride and groom to see each other before they walk down the aisle— a private moment where they can be together to hug, kiss, wipe away tears, twirl and so much more! Ofter times, during a ceremony a couple will be lucky to exchange a few whispers before everything gets underway, but when you do a first look you have an endless amount of time to talk and revel in the moment. It’s a chance to talk about how nervous you’ve been, an opportunity for your groom to tell you how stunning you look, and most importantly an opportunity to be together away from the crowd of on-lookers. It will be just you, your soon-to-be husband and your photographer (shooting from a distance!) in a romantic location.The best part is your photographer will capture all these sweet moments for you to relive and remember exactly how you felt— all the nervous butterflies and sweet embraces! Here are 4 benefits to doing a first look! I’m always an advocate for having my couples spend as much time together as possible! As everyone will tell you— your wedding day will fly by! Scheduling in more private moments with your partner will help slow down the day and allow you to soak it in. After all, you’ve been planning this day for so long you might as well spend as much time enjoying it together as you can! Also, I love seeing couples breathe a sigh of relief as their nerves settle during a first look. Brides and grooms always seem to calm down and really start appreciating the day once they’re together. Scheduling a first look maximizes your time with your photographer, allowing you to capture the majority of your photos ahead of time leaving you time to relax and enjoy the experience. And don’t worry—you can always sneak away during golden hour to capture those gorgeous sunset portraits too! Yet another perk to doing a first look is seeing your groom and having the majority of your photos taken when your hair and makeup are the most polished. As soon as your hair and makeup are finished you will slip into your dress and head out the door to your first look location. Keep in mind that there is always time before the ceremony to do any last minute touch ups if necessary too. Ok, so if none of these other benefits have convinced you then I’m pretty certain this one will do the trick! Who wouldn’t want to attend their own cocktail hour and enjoy all the delicious appetizers they’ve selected for the day? If you do a first look you can get most of your photos out of the way, leaving you extra time post-ceremony to go visit with your guests and mingle. Rather than feeling obligated to go table to table during your reception you can be sure to meet and greet with your friends and family while sipping your signature wedding drink. It’s a win win if you ask me! I asked a few of my past brides to share about their experience with doing a first look and really they explain it best! After all, they've been through it! There responses warmed my heart to read and I'm so thrilled to share them! "My first look with Andy was one of my favorite parts of our entire day. I'm so happy we did it! Things are so stressful and hectic in the months leading up to your wedding and, especially that week, I was out of my mind worrying about everything from the weather to the guests to the music at the reception. It really is so easy to lose sight of the real reason you're throwing this huge party to begin with. That's why I loved the first look. Being able to take a step back from it all and see Andy, my love, the man who I would be so fortunate to marry in just a few hours, in a private moment that was just the two of us was such a treat. And, it totally calmed me down! I had butterflies in my stomach all morning long and I was buzzing with nerves and anticipation, but when I saw him all of that disappeared and what I was left with was pure excitement and joy. "It is definitely a balance between capturing the day and being in the moment and I felt like the first look was the perfect way to do both." "A first look was important to me initially because I really wanted to make sure we weren't so wrapped up in documenting our day that we didn't have time to enjoy it. I love cocktail hours of weddings, and I didn't want to miss my own! But having gone through it and looking back on it I think the best part was that I got to hang out with Mason throughout the day. I felt like we still had a special build up to seeing each other, and I was so excited for him to see me in my dress!
" I was nervous walking up to Adam but the second he turned around it was pure happiness." When the time arrived to do our first look we were both anxious and ready to finally see one another. It was a very emotional, happy and exciting experience. I was nervous walking up to Adam but the second he turned around it was pure happiness. We loved that it was just us and how intimate it was. It gave us some time to soak in the moment.